With Q3 earnings season winding down, it is safe to say that even though 3Q earnings came in sold, rising about 26% Y/Y, they are providing little support for the market. Companies that beat on both EPS and sales have seen scant rewards, while companies that missed have been viciously punished. The reason for this is Wall Street's growing obsession with "peak earnings" which, in a time of stable revenues, means rising concerns about profit margins. Not surprisingly, Goldman's chief equity strategist David Kostin dedicated his last Weekly Kickstart note to what companies laid out as the three main sources of margin pressure going into 2019, which were as follows: (1) increased tariff rates, (2) a tight labor market, and (3) rising debt costs. ... he focuses on the same, key variable, namely profit margins, and while he expects aggregate profit margins will plateau at 11.2% in 2019 and 2020, he - like Morgan Stanley last month - makes a notable warning: "History suggests that margin contraction is unlikely without a recession or negative sales growth." Which is not to say that Goldman is forecasting a recession yet: the bank's baseline 2019 forecast is for roughly 2% real US GDP growth, 2% inflation, and sales growth of 5%, "which should support margin expansion." However, Kostin writes that "this outlook is less favorable the further into the economic cycle we move, as a tighter labor market and slowing growth will eventually weigh on profitability." So what are the key risks of margin contraction, and my implication, recession? In October, the unemployment rate was 3.7% and average hourly earnings growth surprised to the upside (+3.1% year/year, the highest this cycle). Our Wage Survey Leading Indicator points to more wage pressure in the near term. Our previous analysis showed 13% of S&P 500 revenues are devoted to labor. Historically when labor costs are rising more than inflation (i.e., companies are unable to pass on costs to consumers), S&P 500 margins have contracted. We estimate that every 1 pp increase in labor cost inflation lowers S&P 500 EPS by roughly 0.8% ($1). In addition to wages, another threat to margins is that materials and other inputs costs have been rising. Oil prices have risen 8%YTD. During 3Q earnings calls, many companies have also discussed the headwind from higher input and logistics costs. 57% of respondents to NABE survey have reported rising wages and 55% have reported rising input costs, well above the share reporting higher prices charged. Gaps in this measure have typically preceded EBIT margin contraction and we expect these downside risks will persist in 2019. The US has imposed tariffs on $200 bn of imports from China and our political economist assigns a 60% likelihood tariffs on an additional $267 bn will be imposed. Conservatively assuming no substitution of suppliers and no pass-through to consumers, these tariffs could lower S&P 500 EPS by as much as 7%. However, the ultimate impact is likely to be smaller. Firms have indicated that they plan to reorganize supply chains and pass through higher costs to customers. We estimate that S&P 500 firms would need to raise prices by just 1% to offset the potential 7% negative EPS impact from tariffs. Finally, rising interest rates will likely increase borrow costs for companies. The 10-year US Treasury yield has surged from 2.4% at the start of the year to 3.2% currently. Our economists forecast a bear flattening of the yield curve as the Fed hikes the funds rate five times to 3.25-3.5% by year-end 2019 but 10-year bond yields rise by only 20 bp to 3.4%. With leverage for the median company near record highs, companies will face higher borrow costs in coming months. However the median interest coverage ratio, which accounts for disproportionate balance sheet strength of some large-cap technology stocks, remains healthy and suggests some ability to withstand rising interest rates. Similarly, changes in 10-year US Treasury yields have a minimal net impact on S&P 500 EPS in our top-down model. Earnings of Financials benefit from higher rates, while other sectors experience downward margin pressure. While the aggregate risk from interest costs on S&P 500 EPS appears limited, stocks with weak balance sheets will be more vulnerable. While Goldman does not find the above risks to be sufficiently material to cause the company to project a margin contraction, instead expecting no margin growth 2020, reading between the lines one finds that Kostin's next move - should the economic situation deteriorate in the coming months - will be to do just that, and predict the first margin contraction since the oil and manufacturing recession of 2015. As a result, Kostin concludes that "the rapid EPS growth rates of 2018 are unlikely to continue into 2019 and 2020 as the US economy moves later into the cycle. We have already seen signs of a tighter labor market, rising wages and input costs, and a stronger trade-weighted US dollar, which represent headwinds to profit growth." 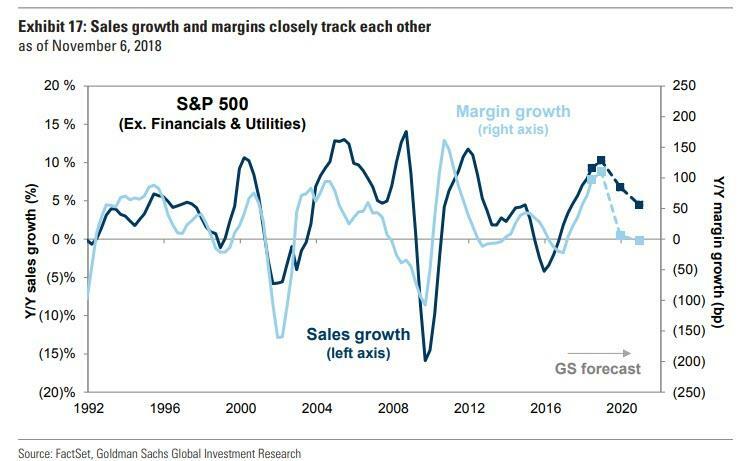 So with Kostin now having warned that "margin contraction is unlikely without a recession", the moment corporate margins are expected to post a negative Y/Y print in 2019 or certainly in 2020 when they are already forecast to not grow as of this moment, is when Goldman will join the bears and throw in the towel on the US economy.